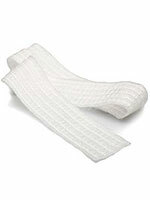 Convatec Aquacel AG Hydrofiber Ribbon Dressing 2/5 X 18" 5/bx 420128 for moderate to highly exuding chronic and acute wounds. Convatec AQUACEL® Ag Hydrofiber® Ribbon Dressing with Strengthening Fiber and Ionic Silver 2/5" x 18" Size, Sterile, Highly Absorbent, Nonwoven. AQUACEL® Ag dressing incorporating unique Hydrofiber® Technology with 1.2% (w/w) silver combines the favorable gelling characteristics of Hydrofiber® Technology with the broad-spectrum antimicrobial properties of Ionic Silver (Ag+). It is a versatile primary dressing indicated for moderate to highly exuding chronic and acute wounds where there is an infection or an increased risk of infection. when used in a comprehensive protocol of care. Also available in ribbon form, with stichbonding for added strength. Silver impregnated antimicrobial dressing with strengthening fiber. For moderate to high exuding wounds which are infected or at risk of infection. Provides rapid and sustained antimicrobial activity. Removes without leaving residue or causing trauma to wound, Manages painful wounds.